JNN 28 Oct 2014 Lahore : Lahore Anti-Terrorisim Curt (ATC) has order for the immediate release of top Pakistani Shia leader, Syed Ghulam Raza Naqvi on Monday after he was passed his 18 years imprisonment without any charges. But the Biased Punjab Govt has still not released him. 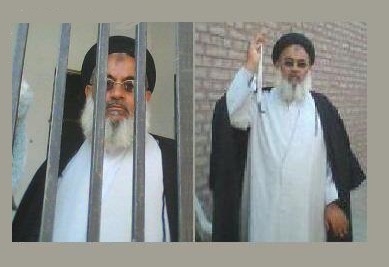 Shia leader Ghulam Raza Naqvi, the Head of Sipah-e-Muhammad Pakistan (SMP) was imprisoned in 1996. SMP is a Shiite Islamic resistance group and a former political party based in Pakistan that was formed in the early 1990s (the exact date of formation is not known) as a response to sectarian violence against Pakistani Shiite Muslims orchestrated by Deobandi takfiri terrorist movement such as Sipah-e-Sahaba Pakistan and its allied Terrorist Outfits like Lashkar-e-Jhangvi . On August 14, 2001, SMP was banned by President Pervez Musharraf. Maulana Ghulam Raza Naqvi who has been imprisoned in solitary confinement for the Last 18 years for the crimes he has never committed , on which he has been suspected ,But still he is not being freed , even after he has been acquitted from the Judiciary in all the cases against him , The only crime he confesses and is Proud of is that he belongs to the Shia community , and is the follower of Hazrat Muhammad PBUH , and his Ahle Bait. Maulana Ghulam Raza Naqvi, who is the Chief of the Shia Organisation, Namely Sipah e Muhammad PBUH , The primary objective of the SMP is the protection of the Shiite community from Wahabi fundamentalist and terrorist outfits. Its main rival are the Wahabi terrorist Organisation like Lashkar-e-Jhangvi (LeJ), Sipah e Sahaba Pakistan and their allied Organisations and cells. SMP chief Ghulam Raza Naqvi is also reported to have visualised the creation of Al Quds force comprising of both Shias and Sunnis to ‘liberate’ Jerusalem. But that was the Biggest crime he has ever thought of as this would have United the Two Main Sects of Muslim, and have given rise to the Unity among Muslims , against the Zionist Terrorism around the world and specially to liberate the Qibla e Awal of Muslims around the world. Tens of Shiite people staged a protest outside the Camp Jail on Ferozepur Road in Lahore for hours after the Punjab government didn’t release Ghulam Raza Naqvi in connection with Muharram. Shadman police said Mr Naqvi, who was supposed to be released by jail authorities after the completion of his life-imprisonment on Monday, was again detained for a month on the orders of the Biased Provincial Government. Police said Naqvi’s followers, who came to receive their leader, raised slogans against the government and demanded release of their leader. The protest was in progress till the filing of this report. Sipah-e-Muhammad Pakistan (S.M.P), Soldiers of Muhammad PBUH , is a Shiite Islamic group and a former political party based in Pakistan that was formed in the early 1990s (the exact date of formation is not known) as a response to sectarian violence against Pakistani Shiite Muslims orchestrated by Saudi Sponsored and US Created Wahabi / Deobandi Terrorist movement such as Sipah-e-Sahaba Pakistan and its allied Groups Like Lashkar-e-Jhangvi . On August 14, 2001, Sipah e Muhammad Pakistan ( SMP ) , Lashkar e Jhangvi ( LeJ ) , and Sipah e Sahaba Pakistan all were banned by President Pervez Musharraf as terrorist Organisations . While the Later SSP and LeJ were still Operational under different Names , while SMP has become completely Non Operational , due to the Ban and Plus the Lengthy Imprisonment of its Chief Ghulama Raza Naqvi. During the 1980s, Zia-ul-Haq allowed and encouraged the militant Deobandi Islamization of Pakistan. One of the organizations that arose in this period was the Sipah-e-Sahaba Pakistan , a Deobandi-supremacist Terrorist group that considered the Shiite Muslim minority to be ‘infidels’. The Deobandi militia Sipah-e-Sahaba targeted and Bombed Shiite mosques, community leaders, as well as Iranian visitors and diplomats. They orchestrated the assassination of Iranian diplomat Sadiq Ganji in Lahore, Pakistan. They were also involved in the killings of Iranian Air Force cadets visiting Pakistan in the early 1990s, when sectarian attacks on Shiite Muslims in Pakistan were at their peak. Both acts occurred in the northern city of Rawalpindi and greatly disturbed contemporary Pakistan-Iran relations. In response to this, Maulana Mureed Abbas Yazdani is believed to have formed Sipah-e-Muhammad as a splinter of the larger and more mainstream, Shiite political organization, Tehreek-e-Jaferia Pakistan (Movement of Shiites, Pakistan), since that organization was not encouraging a violent response to the Sipah-e-Sahaba’s attacks. Sipah-e-Muhammad’s primarily aim was to Provide Protection to the Shiite Community and to Counter the threats of terrorism against the Shiite Community from the Saudi Sponsored Wahabi / Deobandi Terrorist Organisation , Like Sipah-e-Sahaba Pakistan ( SSP ) or Lashkar-e-Jhangvi ( LeJ ) . However, with the subsequent rise in the violence against Shiite Muslims, it was thought to be reforming. The movement got a strong response Due to the Sense of Insecurity and Non responsive attitude of the then Govts and LEA’s against the terrorism Infested by the SSP and LeJ terrorists through Out Pakistan , While Getting the Positive response from all the Shiite communities in Pakistan, But the majority Shiite town of Thokar Niaz Baig Became the Pivotal Point and the Key Town to give it a Boost in its Working . The leaders of the Sipah-e-Sahaba Pakistan and its Allied Lashkar-e-Jhangvi were also affiliated with the Taliban and its sub-groups Like Tehrik e Taliban Pakistan , in Pakistan. The Government of Pakistan designated the Sipah-e-Muhammad a terrorist organization, and it is classified as a Foreign Terrorist Organization under U.S. law. As a result, its finances are blocked worldwide by the U.S government. This entry was posted in Asia Pacific, Jafria, Pakistan News and tagged Ghulam Raza Naqvi, Molana Ghulam Raza Naqvi, Sipah e Muhammad Pakistan, Sipah-e-Sahaba Pakistan, Syed Ghulam Raza Naqvi. Bookmark the permalink.